A massive demonstration was held in front of the Matara Central Bus stand with the participation of 1200 people. Most of the participants were people from the Relief camps from Weligama , Matara, Devinuwara and Dikwella areas. The protesters marched from the Central Bus stand towards Disrict secretariat office in Matara Fort. Chnting slogans and demands of the victims. After reaching DS office a petition containing the demands of the people was hand over to the District secretary S.A. Piyasena. The Police had come to give the security. 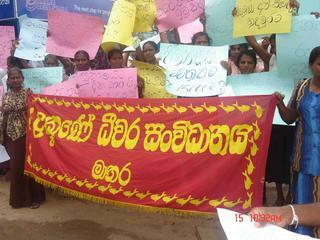 This protest was organized by the NAFSO partner in Matara , Southern Fisheries Organization.